Well, Christmas has gone and today for me is known as Boxing Day, a tradition that goes back further than the invention of the inline Four Honda, and today as I sit at home and reflect on the last 12 months, I thought that I would type up a blog on the good old CB750 Honda, as some of you may know, I have built so many of these since coming to California that I should have shares in the Japanese Iconic Company. 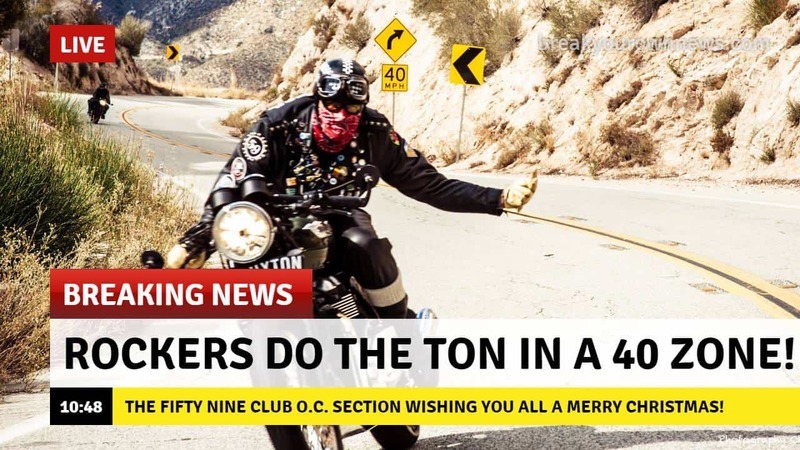 The Custom scene has come on so strong here in the USA and of course Globally, it wasn’t that long ago people would literally stop and stare then eventually get the courage to ask what style of Motorcycle it was that I was riding. it is amazing how far we have come in such a small amount of time. OK, I understand, we haven’t made a significant impact on the world Like Space X or when Super Glue was first invented, but now I feel we have a Mechanical Camaraderie, where there was just a distance nod from other creators in the same country. Today I wanted to blog about this inline Four that a company over in Nampa, Idaho named Rawhide, the owner Branden Wurtz. 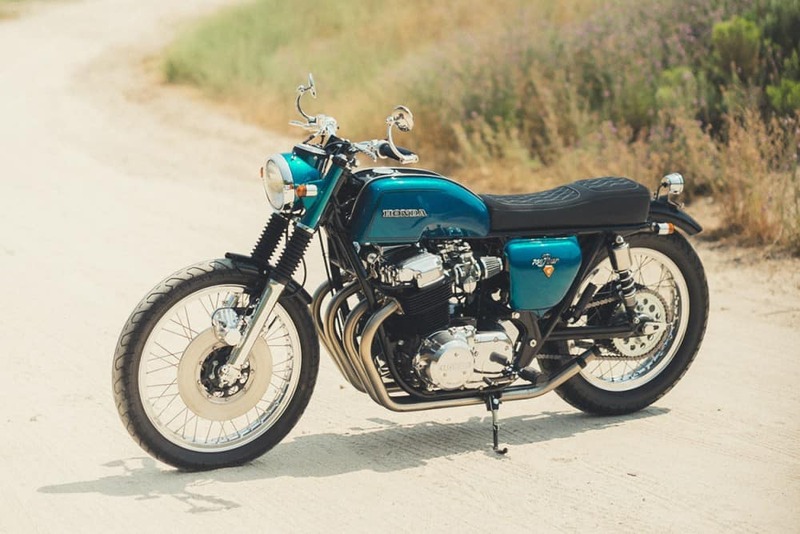 And as you can see they have created a CB750 thats a K5 era and gone a slightly different route and something I think needs to be shared. 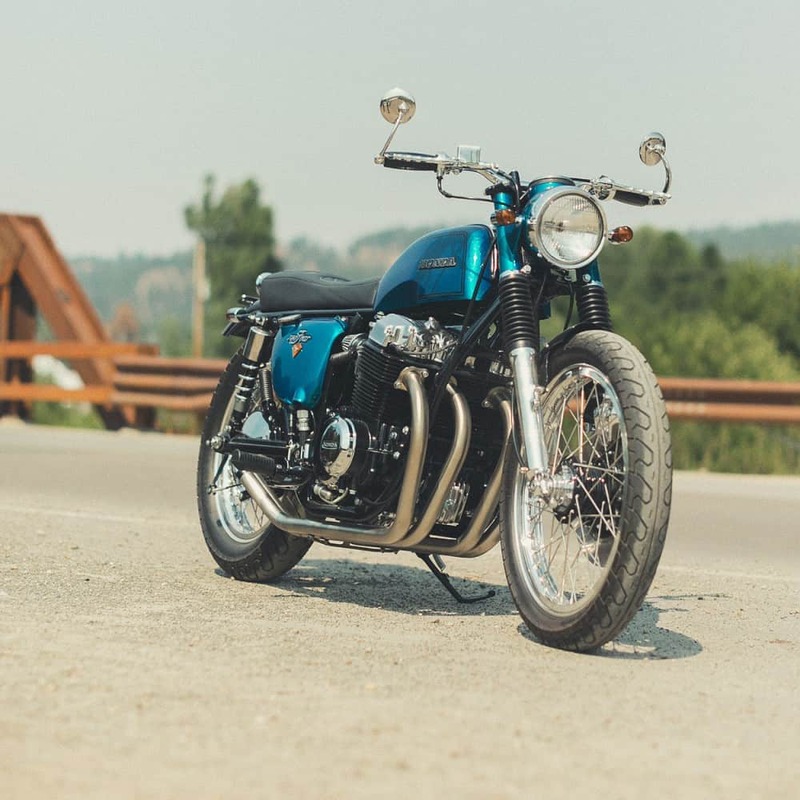 I enjoy looking at other builds too and it means we all have a simular interest and we show the same bike in different guises, how cool is that to see? Branden had a bike listed called the golden Goose but, it had already been purchased, but offered the customer a slightly similar build if he was still interested, the Customer was 700 miles south of him in my part of the country in California.. His Name was Tom and knew what he wanted, Branden listened and came up with a pretty good compromise, offering something custom but could of existed back in 1975 if Honda had enough run with the design team in Tokyo. This takes a little time and a lot of effort but the crew at Rawhide were up for the challenge and the gauntlet was thrown down. The Motor seemed a little tired and like you always should do, it was torn apart and Hopped up. “We used a Wiseco 836cc kit, with the most aggressive street profile WebCam Racing recommends with their billet camshafts,” says Brandon. The Honda now has new valves, seats and valve guides, new primary chains and tensioner, and a new cam chain, tensioner and guide. Rawhide cleaned and inspected every single part, rebuilding the transmission along the way too. A strong motor is imperative in these long, fast highways of life and as the speeds of Modern day traffic increase, we need to do the same with these old 500 pounders, and its nice to know that if there is trouble coming up behind you, a quick twist of the proverbial wrist, will make sure you are way out of that issue. Tom being 6’3 needed a long seat and wanted a shorter looking tank, so an old CB200 gas tank was Located, then the sides were scalloped to allow for the 2 outer carbs to be able to slide freely and not hit the tank, the tunnel was cut out and refabbed to allow it to sit on the Duplex Cradle frame and made sure it sat level and looked like a factory fitting. They then epoxied the Petrol tank using GTL Advantage to make sure there was no delamination or horrible leaks, as this was going to get an expensive paint job and had to be right on the money. Branden used the Factory side covers but trimmed them back to give a cleaner and tighter look and pulled that job off very well. Meanwhile the front end needed some work, so with Deep Dish and high shoulder Borrani Rims, these were laced with spokes from Buchanan, who are not far from me in California, the hubs were cleaned, degreased and bearing removed and then powder coated Black and assembled once more with polished embellishments. 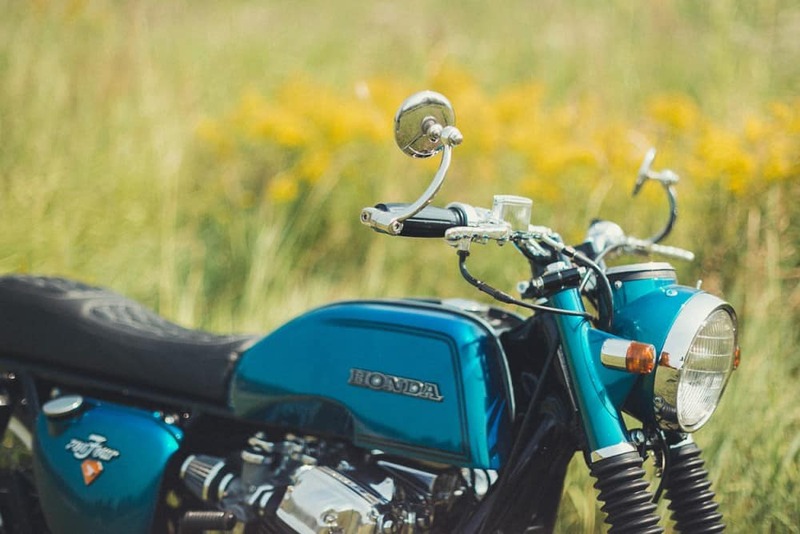 They chose to go with a smaller but neater set up for the headlight and upper fork stanchions but re-fabbing an old Honda CL77 headlight shroud (1967) as that model had a recessed speedometer and cleaned the top of the triple tree up for sure. 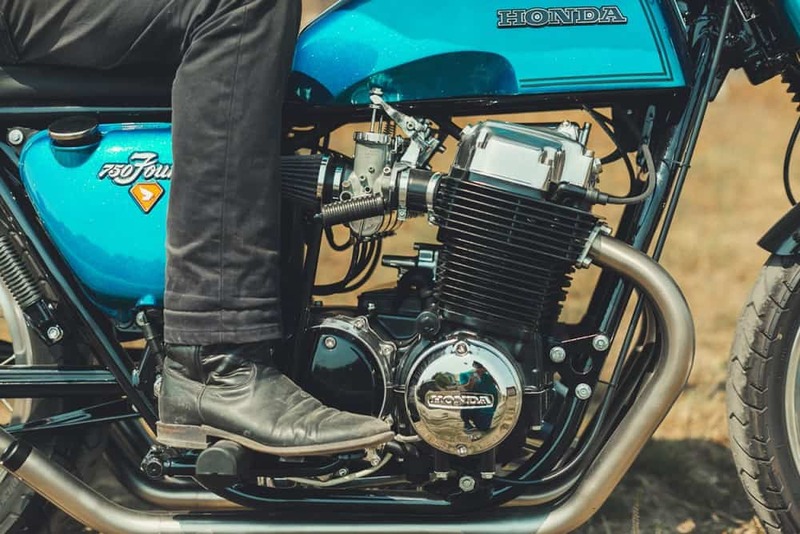 The front fender got a thorough trim, taking off a good chunk of the original but a shorter fender does make the front tire look bigger, they also lowered the fender, rebuilt the caliper and polished the Body, New gators and polished Lowers on the forks complimented the bike. A set of 12.5 inch Sprung shocks at the rear from Hagon were applied but chromed covers fitted to give it that old style CB750 look, of which I have done too and love that styling . 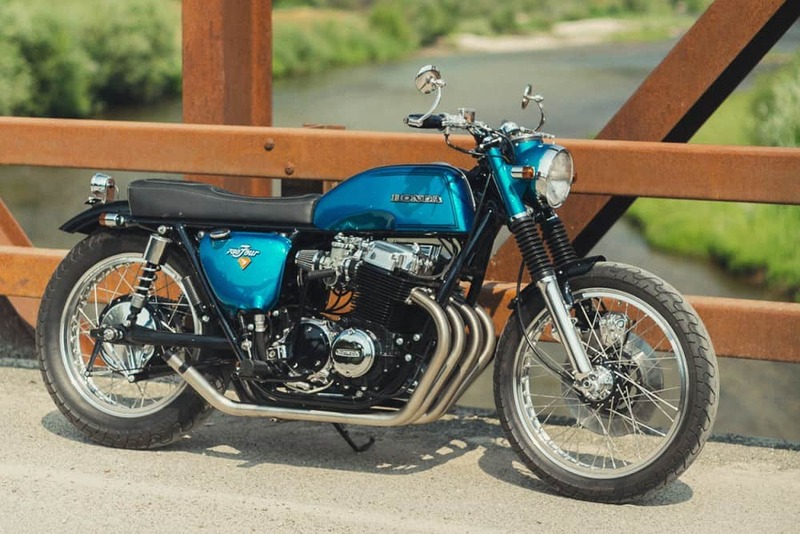 The bars are low-rise CB400F units, kitted with controls from a 1965 Superhawk. Complementing those are Halcyon bar-end mirrors, a Kustomtech master cylinder, and scalloped clutch and brake levers. A neat and custom look that many Builders leave stock, so always refreshing to see the extra yard made on builds such as this. A reconfigured wire harness was made from scratch but using the stock Honda wiring colors to make things more understandable for later on in life if things need to be changed or updated etc, it makes sense I tell you. Upgrades include a Charlie’s Place electronic ignition, Dynatek coils, a regulator/rectifier from Rick’s, and an Antigravity Lithium-ion battery. A Posh Japan taillight and turn signals round out the lighting. Giving the bike a more Traditional look and it flows vert well to cover the square end of that seat assembly off, the Devil is in the detail remember. 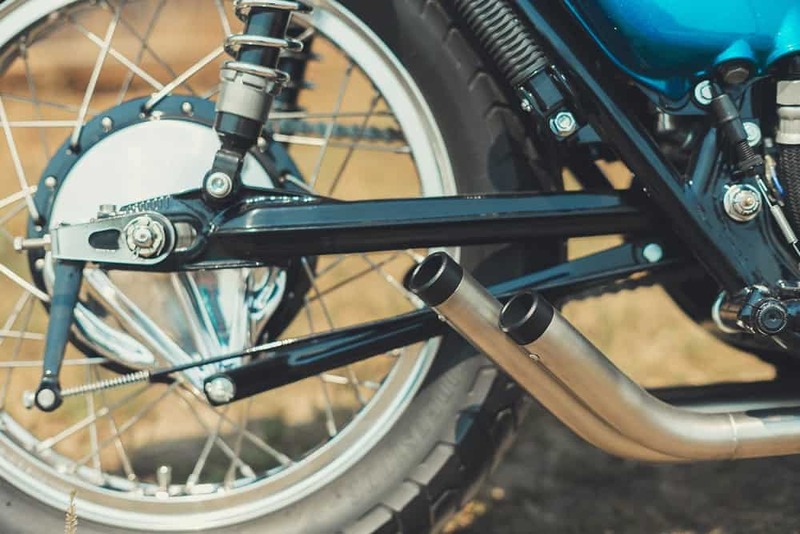 Finishing things off is a customized four-into-four stainless steel exhaust system, with each header terminating in a custom-made end tip. Rawhide designed the slip-in tips with baffles, and then had them machined and coated in a high-temp semi-gloss black finish. 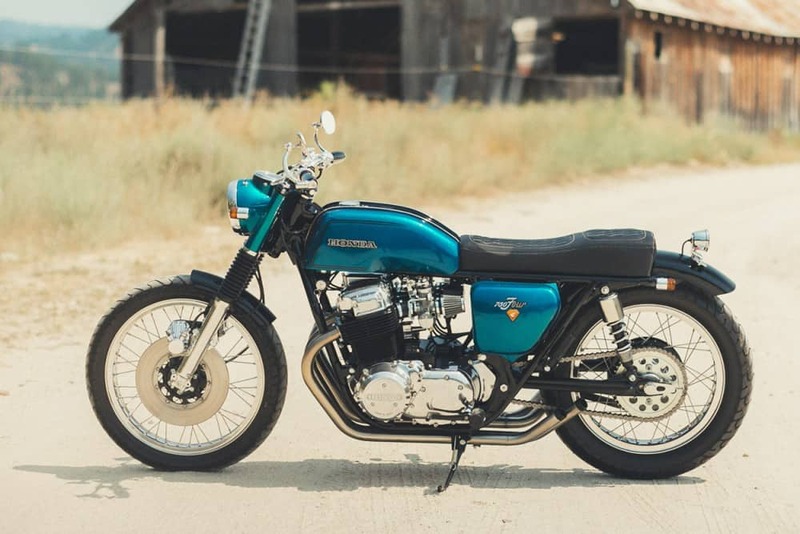 The bike’s been shot in a House of Kolor ‘Oriental Blue Kandy’ with a green micro flake, and adorned with original Honda badges. 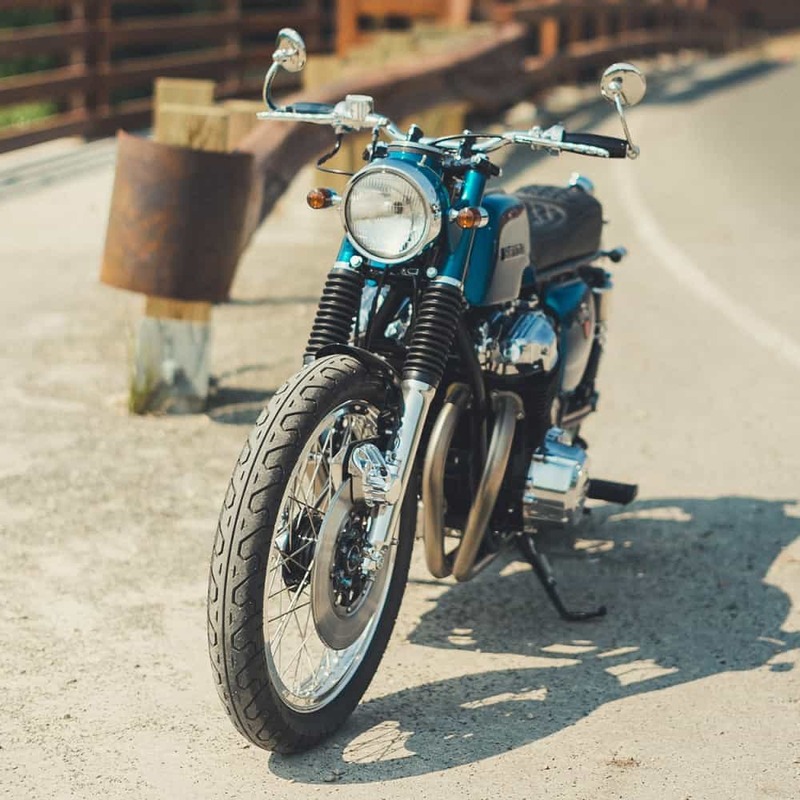 The bike turned out well and Tom is a Happy Chappy, he likes the low end torque of this old 500 pounder and with all the little hop ups, it does not hang about and you may often see the tire spin as it gallops down the tarmac with the bark of the hand formed exhausts. There is way more here than meets the eye and all the nuts and bolts were either zinc plated or chromed, and that does indeed show on a much closer inspection. A cool and different approach and something I like to see, well done mate and I hope to maybe see this at a show down our way at sometime. 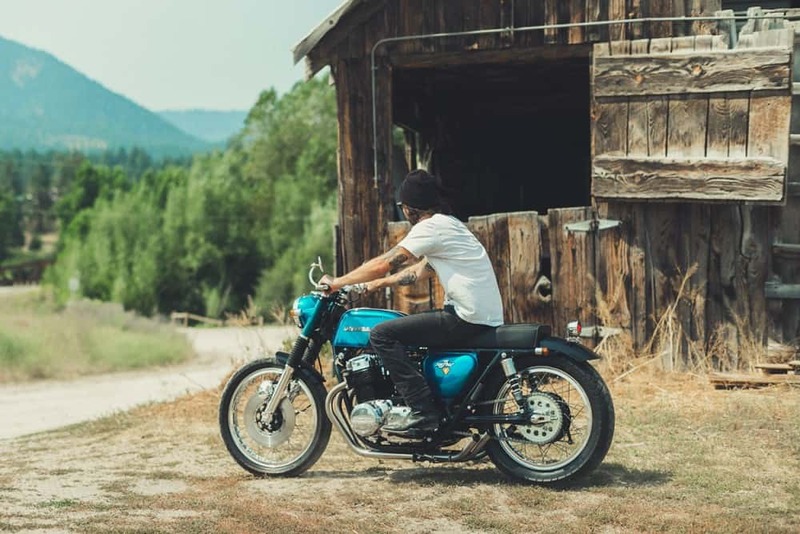 And what a superb location to take a photo of this Japananese machine, what an epic barn and an epic Honda that I believe no matter what guise it takes on, will always turn heads. Let me take this opportunity to Wish you ALL a very Merry Christmas and hope you enjoy this festive time with Family and friends, many thanks for supporting me, small businesses need support and I am Blessed to have such loyal customers. Enjoy. Peace & Grease to you ALL! 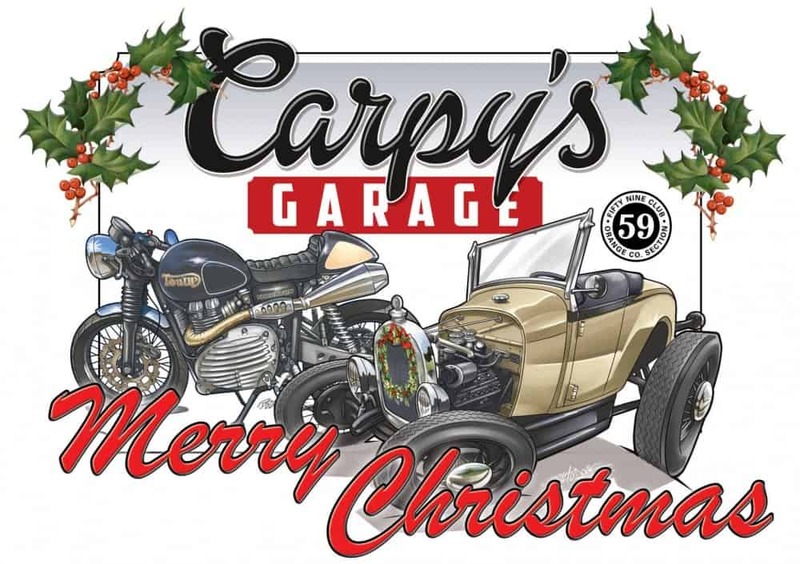 This entry was posted in Blog and tagged 17 years, 4 into 1, 59 club, cb750, cb750a, cb750f, cb750k, creating bikes, custom, custom builder, Honda, inline4, Merry Christmas, Nampa, nostalgia, Rawhide, Rising Sun, rockers, sohc, ton up, yoshimura. 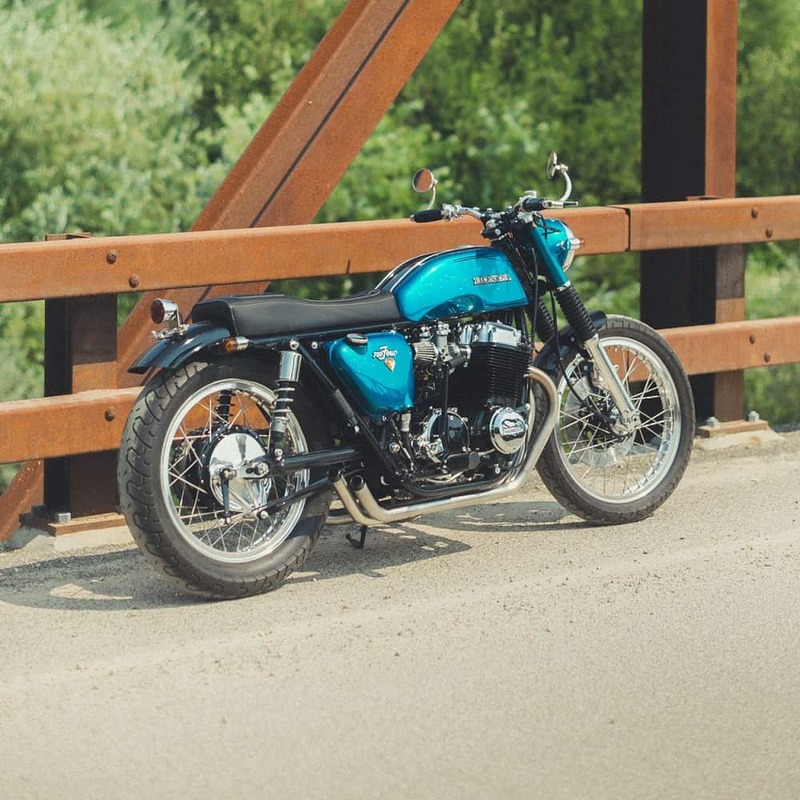 Canadian Norton Custom Brat-Scrambler is a real eye catcher.